"Robert Stadler intervenes in diverse fields, obliterating hierarchies between - as he puts it - Duty Free proposals, and industrial or public commissions. He questions the object’s identity and explores the exhibition space in order to scramble the usual categories of art and design." Robert Stadler was born in 1966 in Vienna, Austria. He studied design at IED/Milan and at ENSCI/Paris. In 1992 he cofounded the Radi Designers group which was active until 2OO8. The group created limited edition pieces for Galerie kreo and also major industrial design commissions such as the meal set for Air France or two complete ranges of kitchen appliances for Moulinex. In 2OO1 Robert Stadler set up his own design studio in Paris. 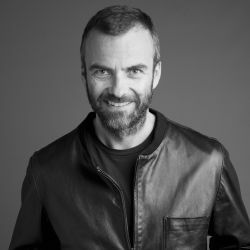 He works for clients such as Dior, Lobmeyr, Palais de Tokyo, Ricard, Thonet and Vitra and also has created a number of limited edition pieces for Carpenters Workshop Gallery since 2OO8. His work is included in several private and public collections such as MAK - Museum for Applied Arts / Contemporary Art in Vienna, Les Arts Décoratifs in Paris, Fondation Cartier pour l’Art contemporain and Fonds National d'Art Contemporain. Robert Stadler has curated several exhibitions amongst which QUIZ at Galerie Poirel in Nancy and at MUDAM Luxemburg. In 2O17 the Noguchi Museum in New York presented his first institutional exhibition in the US in dialogue with Isamu Noguchi’s works. In the same year his first survey exhibition was shown at Kunsthalle im Lipsiusbau in Dresden, Germany. Robert Stadler intervenes in diverse fields, obliterating hierarchies between - as he puts it - Duty Free proposals, and industrial or public commissions. He questions the object’s identity and explores the exhibition space in order to scramble the usual categories of art and design.